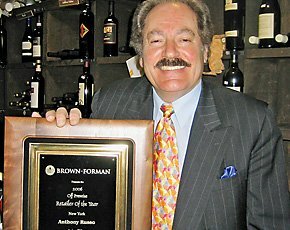 At the annual convention of the American Beverage Licensees Association in Las Vegas in March, Anthony Russo, owner and operator of Aries Wine and Spirits in White Plains, received the Brown Forman Beverages Worldwide “Retailer of the Year” award for the New York metro region. This award acknowledges significant contributions made by a wine and spirit business owner in support of his industry, trade associations and community. Russo opened Aries Wine and Spirits in 1984 with part time assistance from his wife Andrea, who then was pursuing her own corporate career but who shared his passion for wine and was herself a wine educator. Over the last 22 years, Russo has combined community involvement with his retail presence in White Plains. He is an active member of the White Plains Rotary and has served on its Board of Directors and as program chair. He is also a member of the Westchester County Executive’s Italian American Advisory Council, the Business Council of Westchester and the Westchester County Association.